As with other ships in Norwegian's fleet, Getaway practices Freestyle dining, meaning there's no early or late assigned seating, and reservations are not allowed in the complimentary dining rooms, except for Haven passengers. We found quality varies depending on the venue, and while you will pay for better quality in the specialty dining venues, Norwegian has been working hard to upgrade its main dining experience fleetwide. On Getaway, this is reflected in dining choices that showcase a bit of international flavor and variety. Think innovations like Vietnamese pho soup for lunch or a vegetarian Indian curry for dinner. The options now extend beyond cruise-ship standards like steak and fish, expanding the menus in line with cruisers' more adventurous palates. Savor and Taste (Deck 6): Getaway has several complimentary main dining rooms. Located on Deck 6, across from one another, Savor and Taste share the same kitchen and same rotating menu but are broken up into two spaces to provide a more intimate experience. Decor is similar with slight color variations. Both dining rooms are furnished with dark woods and glass accents, but Savor's color scheme incorporates blue tones, while Taste's includes red ones. On our cruise, Savor served breakfast from 7:30 a.m. to 9:30 a.m. and lunch on sea days from noon to 1:30 p.m. Both restaurants serve dinner from 5:30 p.m. to 9:30 or 10 p.m. Expect dinner entrees that include pork loin, chimichurri skirt steak salad, Szechuan chicken and Indian curry; lunch offerings like salmon burgers, meatball subs, shrimp and arugula salad, and even Vietnamese chicken pho (soup); and desserts like pecan pie, creme caramel, Caribbean pineapples or a warm chocolate volcano. Breakfast items are a traditional mix of eggs Benedict, biscuits and gravy, pancakes, French toast and waffles. Hot and cold cereals, pastries and fruit are also available. Tropicana Room (Deck 7): The third complimentary dining room, the Tropicana Room, has the same main dining menu, enhanced with the feel of a 1940s supper club -- and Norwegian nailed it. The Tropicana Room features floor-to ceiling windows and a central stage with a dance floor. The Latin jazz band playing at the front of the room helps to cement that 1940s feel. Dinner is served from 5:30 p.m. to 9:30 p.m. nightly, and the space also hosts smaller performances of the "Burn the Floor" Latin dance show. Garden Cafe (Deck 15): The ship's main buffet serves breakfast from 7 a.m. to 10:30 a.m., lunch 11 a.m. to 3 p.m. and dinner 5:30 p.m. to 9:30 p.m. A smaller breakfast selection is available for early risers from 6 a.m. to 7 a.m., and snacks are served from 3 p.m. to 5 p.m. and again from 9:30 p.m. to 11:30 p.m. The space is open, with floor-to-ceiling windows that allow ocean views. It's where you'll find buffet staples like made-to-order omelets and waffles, pasta and carving stations, grilled items and dessert. We enjoyed many of the premade cold salads like curried chicken salad with apples. The popular soft-serve ice cream machine is up there, too (with a hard ice cream station at mealtimes). The counters wind around, stations like the salad bars and sandwich-making areas are repeated. Still, walk as far down as you can to weigh your options before filling your plate. Flamingo Bar & Grill (Deck 16): If you don't want to brave buffet lines, the Flamingo Bar & Grill on Deck 16 is conveniently located near the pool and Spice H2O. It serves Latin dishes like pulled pork, rice and beans, and empanadas. The yucca fries with cilantro sauce was delightful, and we couldn't get enough. Recipes were developed by Norwegian's Miami-based staff, and, in general, they deliver an authentic flavor. The space is a light-filled sanctuary to grab breakfast, especially when pulling into port. Breakfast items range from Cuban specialties like pastelitas (guava and cheese filled pastries) and ham, swiss and tomato puff pastries to breakfast sandwiches, fruit and more traditional American breakfast items. Hours on sea days are 8 a.m. to 11 a.m. and noon to 5 p.m., and 8 a.m. to 11 a.m. and 2 p.m. to 5 p.m. on port days. O'Sheehan's Neighborhood Bar & Grill (Deck 7): O'Sheehan's is the de facto place for late-night munchies, with pizza, hamburgers and other comfort food available 24/7. With a two-story TV screen, a miniature bowling lane, pool tables and arcade games, the venue tempts you to never leave -- unless you're sensitive to noise. The decibel level there can be deafening. It's a good option for breakfast, with standards like omelets and French toast, and around 8 a.m. on the first sea day, it was a ghost town. Each night one special entree is featured -- such as prime rib, fried chicken or chicken and waffles -- in addition to regular menu items. This is also the place for tap beer; if you order one from anywhere on the ship, chances are it's coming from O'Sheehan's. Shanghai's Noodle Bar (Deck 7): With long counter seating around an open kitchen, you'll find traditional Chinese noodles, wok-fried dishes and dim sum at the Noodle Bar. Tucked back behind the casino, Shanghai's is unassuming but authentic, hot, fresh and delicious. If you can snag a seat facing the kitchen, it becomes a meal and a show as you watch the chefs expertly prepare your meal pulling noodles from a refrigerated door, chopping the vegetables and putting things in and out of large, steaming pots. Our favorites were the spring roll, char siu noodles in broth (the Chinese barbecue pork was deliciously melty), vegetarian fried rice and fried pork dumplings (or steamed if you prefer), but really everything on the limited menu seemed well done. Haven Restaurant (Deck 16): Haven passengers have their own separate main dining room within the enclave, where breakfast (7:30 a.m. to 10:30 a.m. sea days, 7 a.m. to 10 a.m. port days), lunch (noon to 2 p.m.) and dinner (5:30 p.m. to 10 p.m.) are served. The Haven does take reservations for its passengers, which is a nice perk, particularly if the ship is at capacity. The quality of the food in the Haven Restaurant is a standout. The fettuccine with porcini mushrooms in a truffle sauce (served at lunch) is one of the best things we had all cruise. Standard breakfast items include steak and eggs, Tahitian vanilla challah French toast, buttermilk hot cakes with walnut butter and caramelized bananas, a smoked salmon frittata and fruits de mer in brioche. Coffee comes in a French press, but you'll still pay more for fresh-squeezed juice. In addition, a breakfast buffet with a variety of fresh fruit and accouterments is available each morning. One chef's special is featured each evening for dinner, in addition to menu items like roasted salmon, beef short ribs and wild mushroom ravioli. Haven's lounge and pool also have their own menus, which don't change during the cruise. Menu items include homemade potato chips with warm blue cheese; grilled asparagus and prosciutto; house smoked salmon; Serrano ham, Manchego cheese and marinated olives with grilled country bread; and a tunatini (ginger soy tuna tartare, seaweed salad and sesame seeds). The Haven Bar, within the lounge, is open 9 a.m. to close. Room Service: In-cabin dining is available any time. With the exception of Haven and suite guests, all passengers are subject to a $7.95 convenience fee per order. Breakfast is continental with fruit, yogurt, pastries and cereals; other menu items include chicken soup, sandwiches, salads and a few dessert offerings. There are 28 restaurants on Getaway, meaning diners are spoiled for choice, especially if they don't mind paying extra for meals. Our favorites were seafood standout Ocean Blue and the ship's two steakhouses, Cagney's (classic) and Moderno Churrascaria (Brazilian). Other highlights include outdoor dining along The Waterfront and a choice of ethnic cuisines. Foodies might want to look into Norwegian's Ultimate Dining Package, which allows passengers to dine every night in a different restaurant for a set discounted price; cost varies by length of cruise. Keep in mind that popular extra-fee spots like Cagney's and Teppanyaki fill up fast, so if you have your heart set on a particular venue at a particular time, reservations are essential. Make them well before you board the ship. Judging from the reservation lists, the most popular specialty restaurants seem to be Le Bistro (French), Cagney's (steakhouse) and Teppanyaki (Asian). Teppanaki receives high marks for entertainment value, while Le Bistro and Cagney's deliver a more "foodie" experience. Most venues are open from 5:30 p.m. to 10 p.m. for dinner. Wasabi and Shanghai's are open until 11 p.m.
Teppanyaki (Deck 7); $25 per person: If you like some patter with your dinner, you'll love the hibachi-style Teppanyaki. Eight tables/cooking stations (12 people per table) serve 96 diners, so you'll probably sit with people you don't know, but conversations start flowing pretty quick as the "show" begins. Diners are entertained as the two chefs make chit-chat, tell bad jokes and send onions, eggs and vegetables flying through the air (and into the passengers' mouths). Miso soup is served as the starter; entrees include combinations of chicken, beef and seafood (including lobster), as well as a vegetarian option, all served with ginza salad, vegetables and garlic fried rice. Ice cream or fresh fruit serve as dessert. Le Bistro (Deck 6); $19.95 per person: Le Bistro is the place for Francophiles to get their escargot fix; they arrive swimming in garlic butter, with baguettes for sopping. Diners can enjoy a variety of French fare and a better-than-average wine list. The executive chef mentioned Le Bistro is the most popular venue for celebrating special occasions. Located midship, the restaurant has seats outside in 678 Ocean Place that are meant to evoke a sidewalk cafe; be warned that this option can get noisy and smoky from the casino above. We prefer the more romantic indoor seating. Les quatre cornets (four cones) was an appetizer of tiny cones containing a variety of fillings like duck confit, smoked chicken salad, salad Provencal, and blue cheese and walnuts; everyone at the table wanted to know what they were, and they were a great choice for an indecisive diner. Our roast rack of lamb was cooked to perfection -- no easy task -- and we heard good things about the duck and coq au vin, as well. Three bistro specials, including fruits de mer, are listed at an additional $10 per diner. Dessert features a two-person fondue (more chocolate than we knew what to do with) and an exceptional cheese plate. La Cucina (Deck 8); $14.95 per person: Italian food is always a crowd-pleaser, yet La Cucina never seems to receive the accolades that other Norwegian specialty restaurants get. The Tuscan-influenced space is charming, with wooden beams, twinkling lanterns and outdoor tables on the Waterfront. The indoor/outdoor atmosphere seemed to be a draw for both couples and large parties. (We have it from a good source that this is the favorite restaurant of Rune, the ship's captain at our time of sailing.) Choose from a range of antipastos, soups, salads, meat dishes and, of course, pizza and pasta. Cagney's (Deck 8); $29.95 per person: Cagney's has the traditional steakhouse feel, with warm wood and leather. The most popular dining venue onboard Getaway, the steakhouse sticks to basics with four varieties of certified Angus beef from 5 to 18 ounces with seven toppings and four sauces to choose from. From the five starters, the shrimp cocktail with Jack Daniel's cocktail sauce was a popular choice; two soups and three salads round out the pre-entree dishes. Chicken and ribs are available as alternatives to steak, and three options are listed under Fisherman's Corner, with the grilled sea bass drawing our attention as a potential hidden gem. If you're vegetarian, be sure to request ahead there -- there are no listed options. The highlight of Cagney's is its addicting truffle fries, but don't overlook the other sides. The grilled beetroots and shallots were expertly prepared and a nice break for the palate from the heavier fare. Desserts lure even the most meat-stuffed diners with a popular raspberry creme brulee and a rich Oreo cheesecake. Other options include a brownie, fruit salad, ice cream sandwich and apple crisp. Moderno Churrascaria (Deck 8); $19.95 per person: Moderno serves grilled and roasted meat tableside via roving waiters (called passadors) in a manner meant to evoke a Brazilian experience. You can try all 10 options, including garlic beef, lamb chops, marinated pork ribs and bacon-wrapped chicken. There's a huge salad bar, too, for those who need some greens to accompany all that meat, but it's also stocked with a range of cold pasta salads, cheeses, meats and ceviche. Be warned: Four sides (mashed potatoes, fried bananas, beans, etc.) will arrive at your table just after you've dug into the salad bar. Combined with the delicious pao de queijo (cheesy bread) that's offered, it's easy to fill up before you've even selected your first piece of meat. 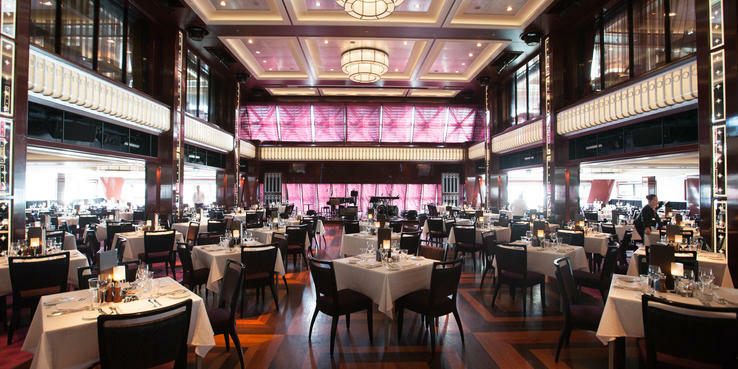 Ocean Blue (Deck 8); $39 per person: Ocean Blue is a seafood restaurant helmed by Food Network star Geoffrey Zakarian. Unlike other specialty restaurants, where you can order more than one appetizer or entree, you're only allowed to choose one option within each category. (Still, if one of them is Zakarian's famed Dover sole which goes for $68 in his NYC restaurant, you're ahead of the game.) Although the space is small, it's cleverly shielded from the hubbub of the 678 Ocean Place; a meal there does indeed feel like a meal at an upscale restaurant. Service is also impeccable, complete with waiters who know their wines. Even kids benefit from the upscale atmosphere -- they're given tablets to play with for the length of the meal. Save room for tea with dessert, as the menu boasts nine gourmet varieties that include a Turkish recipe called the du Hammam. Editor's Note: Ocean Blue is moving to a la carte pricing October 2015. The adjacent Raw Bar focuses on crustaceans and wines by the glass at a la carte prices. You'll also find an Ocean Blue on the Waterfront takeout window that serves a la carte "beachy" favorites like lobster rolls during the day, but only from 12 p.m. to 2 p.m. on sea days (so a total of six hours on a weeklong sailing). Chef's Table (Deck 16); $99 per person: Foodies will adore the Chef's Table, a nine-course meal designed to rival onshore restaurant tasting menus. The meal includes a glass of Champagne and two glasses of wine, selected by the master sommelier and paired with your courses. You also get to meet the chef and tour the galley. While the Chef's Table takes place in the Haven Restaurant, anyone can pay to attend, but take note: The dinners are only held once or twice during a cruise, and they fill up quickly. Wasabi (Deck 8); a la carte: Wasabi is a bar, rather than a restaurant, and it's located in a great spot at the top of the spiral stairs and directly opposite Ocean Blue. Sushi starts at $3 for a vegetarian roll and $3.50 for a California roll. The Godzilla roll costs $4.25, but it's worth it: sweet shrimp, mango, avocado, caramelized cashews and coconut. Combos start at $12, and if you're after hot food, try delicious yakitori chicken, prawns and our favorite, boneless beef short ribs ($3.50). It's great for a quick lunch and good value for money. If you're feeling adventurous, ask the chef to prepare something special according to your tastes. We received something called a volcano roll with tuna, cucumber and scallions covered in tempura crumbles and tobiko (roe) with a spicy chili mayo and Sriracha sauce, all topped with seaweed salad -- excellent. All specialty rolls are listed at $4.75. Take note there is no dessert menu provided with lunch (not that you'll need it), and with dinner, dessert can be ordered from the menu used at Ocean Blue and Raw Bar. Illusionarium (Deck 6); $24.99 for banquette seating, $29.99 for floor seats for the dinner show; $24.99 for Wine Lovers the Musical: The Illusionarium on Getaway is a for-fee dinner experience in which an old-style magic show runs as a story, complete with astral projections, long-dead grandfathers coming back to life and a "competition" of sorts to find the Grand Master magician. If you pull back from the story, what you have a is a pretty average set of magic tricks -- woman in box, disappearing woman, knives in box, some stuff with bubbles, etc. -- but it's the extraordinary attention to detail that really creates an atmosphere that is carried on seamlessly throughout the show. Arrive early to make sure you can get seats in the front. The food is the weakest point of the evening. It features a set menu of prosciutto, followed by deep-fried shrimp and tepid filet mignon, redeemed by the selection of miniature desserts. Waiters wear aviator goggles on their heads and exude a steam punk vibe. Note: A vegetarian dining option is available, but let staff know in advance. Making another use of the funky Illusionarium space, Norwegian has taken a traditional event like wine tasting and turned it into a 50-minute comedy/musical/lunch-and-a-show called "Wine Lovers, the Musical." Mimicking a wine class with a guy and girl from different backgrounds (one's a free spirit, the other's a workaholic -- comedy and romance ensues), the host, "Charlie," guides the onstage actors and the audience through an educational and giggle-worthy series of quizzes, lectures and musical numbers during which you are encouraged to sip and swish your three reds and three whites. (A Prosecco is reserved for a toast at the end, when the actors jump off stage and clink glasses.) Refills are offered, but after seven "tastes," you should be feeling just fine. A duck and asparagus salad, steak and lemon pepper shrimp and mochaccino cheesecake help to soak up the laughs and the libations. The show was held at 12:30 p.m. on each day during our sailing. Carlo's Bakery (Deck 8); a la carte: Dessert-lovers will seek out Carlo's Bakery, an outpost of Buddy Valastro's famous "Cake Boss" empire. The shop has Oreo cakes, cannolis, cookies and other sweet treats. We found the cupcakes pretty to look at, but on the dry side. The cannolis, however, were scrumptious. You can also order custom cakes for birthdays and other special occasions. Tip: If the lines there scare you off, you can order some of the same desserts in the Atrium's Cafe & Bar. Carlo's Bakery hosts a limited number of cupcake and cake-decorating classes that range from $39 to $69 per person, held in Teppanyaki. Dolce Gelato (Deck 8); a la carte: The Waterfront has a Dolce Gelato bar (connected to Carlo's Bakery) that serves up the Italian treat. Flavors range from vanilla, strawberry and chocolate to cheesecake and nougat. There were also two sorbet flavors listed. A regular cup runs $2.50. A single-scoop cone is $2.75, while a double-scoop cone will cost $5. Gelato ice pops are $3.50. Baked goods and coffee are available at Dolce in addition to its frozen desserts.